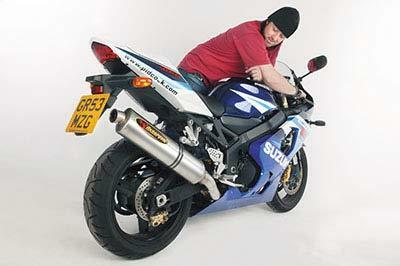 By fitting a sports exhaust you can make your bike several kilos lighter, and better looking too. 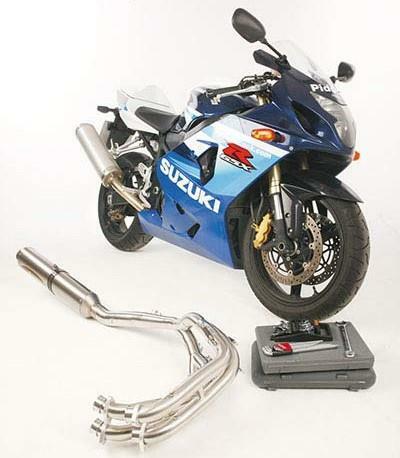 Sports exhausts are also designed to optimise a bike’s power delivery, improving the top-end and smoothing out any midrange unevenness, and tend to be less concerned about meeting the exact same standards for noise or emissions that the manufacturers’ original exhausts have to meet. Even so, nearly all makes of exhaust have removable road-legal baffles, so there’s no excuse not to fit one, especially if trackdays are your main hobby. 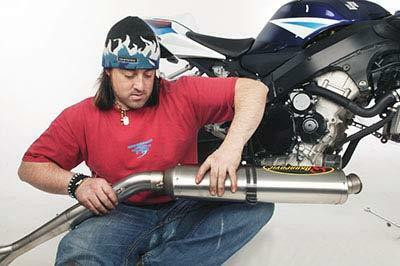 A full replacement exhaust (downpipes and silencer) designed to get the most from the engine. With the bike’s fuelling adjusted to match the new pipe with a Dynojet carb corrector kit (or Power Commander for a fuel injected bike), by an expert on a dyno, power and throttle response can be improved across the whole rev range. You don’t have the patience to keep fiddling about to find the perfect fit. Or if you don’t have the funds/ability to get the fuelling retuned afterwards. Ideally a rear paddock stand, a socket set (8-17mm) with long extension, combination spanners (8-19mm), various screwdrivers, Allen keys (4-10mm), new exhaust manifold gaskets (one per cylinder), copper-based grease. Nuts on the manifold studs where the front header pipes join the cylinder head can be hard and fiddly to remove. If you can use a spanner without stripping threads you should be OK.
1. Check the parts are all there – you’ll be cheesed off if you’ve taken the old exhaust off and fitted half the new one before discovering something’s missing. Loosely assemble the system – thin-walled pipes can get knocked about in transit so if any connecting pipes aren’t round, gently tap them into shape with a rounded hammer. 2. 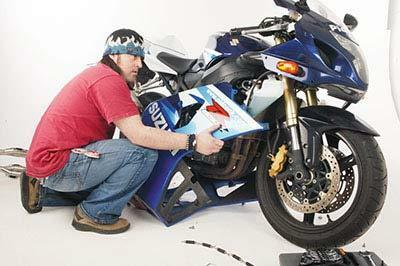 Remove lower fairing panels (tail panels, too, if it’s an underseat exhaust) to get to the header pipes and any other mounts. 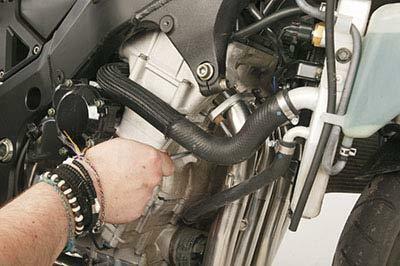 If the exhaust has a powervalve unit, remove the control cables between the servo unit and powervalve – back their adjusters off and unhook. Mark which cable goes where and keep them safe. 3. If you can’t get at the nuts/bolts which hold the header pipe clamps because the radiator’s in the way, try removing the rad’s lower mounts and moving it forward. 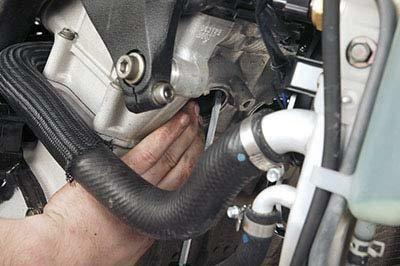 If need be, drain the coolant and remove the rad, or coolant pipe(s). Now remove all downpipe clamp nuts/bolts and mounting brackets under the engine. 4. 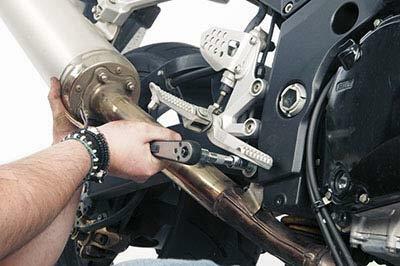 Remove the silencer’s mounting bolt(s), but make sure you support the whole exhaust at the same time (an extra pair of hands comes in useful here). Push/tease the exhaust forward so the header pipes clear the cylinder’s exhaust ports (This may need gentle persuasion with a plastic mallet). Lift the exhaust clear. 5. Flick out the old exhaust manifold gaskets from the ports and put new ones in. A little copper grease will hold them in place. Now fit your new downpipes in the correct order (Nos 1-4 means left to right as sitting on the bike) using the clamps or nuts/bolts removed in stage 3. Don’t tighten fully yet. 6. Now assemble the intermediate (middle) section(s) of the exhaust and fit them to the downpipes. A little grease around the connecting parts of the pipes will help, as will a tap with a plastic mallet or piece of wood against the front, lower areas of the downpipes. Ensure the pipes overlap fully at their connection points. 7. 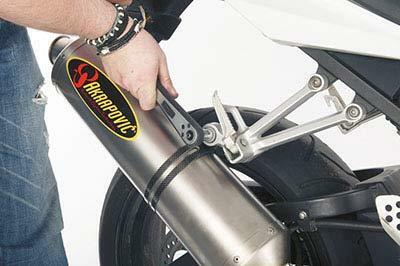 If the bike has an underseat exhaust then there may be another set of intermediate pipes to go on before fitting the silencer/end can – fit in the same way as step 6. 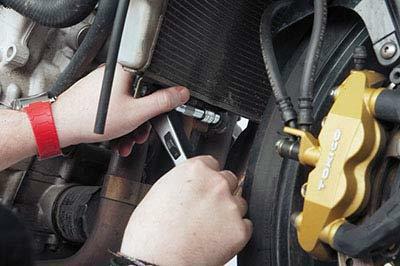 It’s advisable to loosely fit the can’s mounting bracket in place on the subframe/footpeg bracket or silencer beforehand. Now loosely fit the silencer. 8. 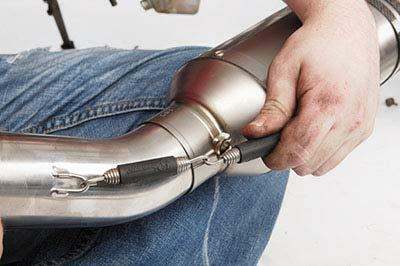 If the exhaust’s joints are held together with springs, now’s the time to fit them – there’s no point doing it earlier because they can get in the way while doing nuts and bolts up. If a spring puller (a T-bar with a hook on the end) isn’t supplied, it may be possible to use a spare spring or a loop of cable as an improvised puller. 9. Tighten all the mounting bolts, starting from the front. 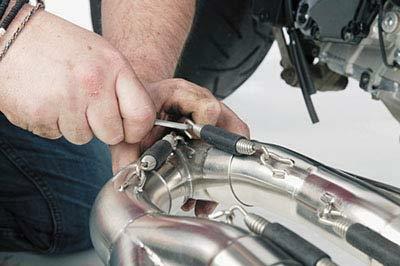 Take care to tighten the manifold clamps down evenly so the downpipes sit square against the manifold gaskets. 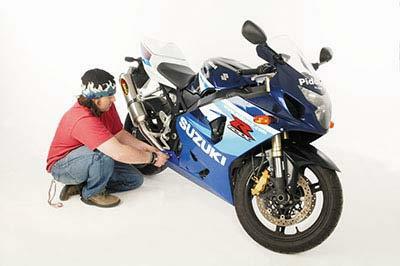 Don’t tighten beyond the correct torque settings (from your manual/ask your dealer). Check the pipes don’t foul cables, pipes, wiring or the engine/frame. 10. If the silencer or its bracket looks unlikely to line up on its mounting point, something’s wrong. Loosen off any clamps forward of the can and realign the connecting joints until it does. If still doesn’t line up then get a fresh pair of eyes on the job before bawling out the supplier. 11. Refit and refill the radiator (if it was removed). Otherwise tighten it back up and put the bodywork back on. Check to see if the pipework fouls the plastics. If it does you’ll have to realign the pipework (see step 9) or in rare cases you may have to trim the bellypan. Start the bike and run to operating temperature. 12. With the engine still warm, carefully (burns are painful) remove the bodywork and rad (if necessary) once more and retighten all clamps and mounts. Why? When bolts/nuts expand with heat they can loosen – you don’t want them to stay that way when they cool down. Refit panels and admire your work.